Supercharge your group with a 30-Day challenge that unlocks impact for malnourished kids. It’s time to Get Active For Good! Active For Good drives engagement by using purpose as a motivator to help participants get active and healthy. When your group does an Active For Good 30-day challenge, magic happens; teamwork and camaraderie are built, healthy habits are formed, and malnourished kids’ lives are saved. Easy to join and administor with world class support. Connection to a global impact story. Get ready to unlock life-saving packets for kids that need them most. Participants commit to getting active during the 30-Day challenge and unlocking life-saving food packets for kids. Our platform is fun and easy to use. Pricing includes everything you need to participate in the challenge including the delivery of life-saving meal packets that your group will unlock for kids. 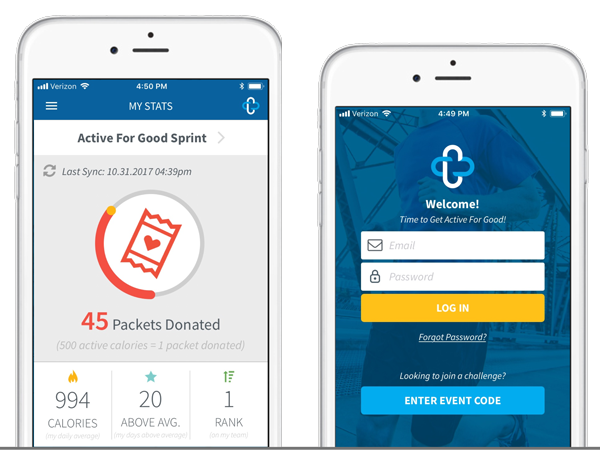 Participants use the free Active For Good app (Android or Apple iOS), they join your challenge with an event code and pick their team and screen name. Our simple app will pull activity data from the built-in Apple Health or Google Fit systems already part of the phone. Our platform also supports Fitbit and Garmin Connect. During the challenge, participants will receive a series of simple, engaging emails as they unlock impact for kids. 86% of people surveyed in our programs said that they were more active when they knew it was helping someone else at the same time. We are a registered 501(c)3 organization. Companies and groups can fund the program from a foundation or charitable contributions budget leaving other budgets intact. You can choose the challenge name and provide a company or group logo that will show up on the platform and challenge email communication to participants. Our platform is easy to administer and you’ll be given everything you need to communicate the program goals, including a digital marketing kit for promotion. Ready to learn more? Get started with a demo. We’ve done challenges with groups of all sizes. From local businesses to large corporations, popup events to large conferences like Dreamforce and TEDx, we’re ready to build a challenge that is every bit as meaningful to you as it is to the kids you’re helping. Access to the platform and apps. Marketing kit to help promote. Life-saving packets delivered to kids. A final report so you’ll know where your impact was made. Already have a wellness platform in place? Looking for a customized option to fit your budget? We are happy to help you wrap the mission and impact of Active For Good into your existing platform or budget. We’ve built custom experiences for large and small organizations in a variety of program formats and platforms. Use the form below to connect with us. Over 17 million children under the age of 5 suffer from SAM – Severe Acute Malnutrition, the most dangerous form of malnutrition. It causes 3.5 million deaths annually. But there is hope! 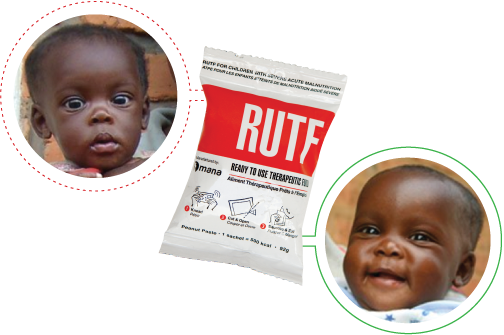 A 6-8 week feeding program (three 500-calorie packets of RUTF per day) permanently eliminates SAM for 95% of those treated. We’ve partnered with leading world aid organizations like UNICEF, Save The Children, World Vision and others to deliver impact around the world. With your help we can unlock packets for kids who need them most. Let’s get started! First, tell us about yourself. Fill out the form below to get started. Someone from our team will be in touch to schedule a quick follow up and answer any questions you might have.